When it comes to effective employee communication, what can you do to keep employees in the loop? It can be a challenge to keep them up to date with all of the important changes that are happening within your business. 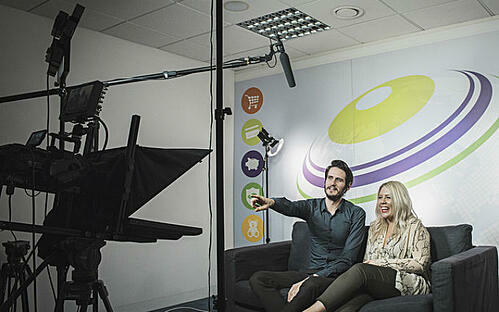 We thought we'd share how we communicate with our staff around the world to give you some ideas and inspiration. Global Briefing is Reward Gateway’s fortnightly in-house TV programme which is aired for the purpose of keeping all of our employees up to date with everything RG. The home of Global Briefing is the third floor of our London office where there’s a full studio set up including an autocue, lights, boom microphones and a full editing suite where our two resident Video Production Managers record and edit the segments. 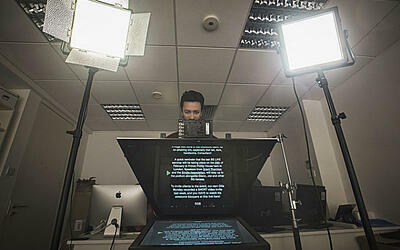 How many companies can say they have their own studio and video production team?! It’s pretty special! GB is hosted by myself and my colleague Rob Marsh. We try to make it as engaging, funny and informative as we can so that all of our employees look forward to GB every other Monday. 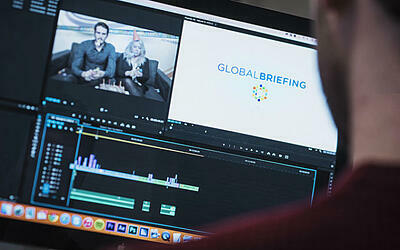 Global Briefing is filmed in London on a Thursday, edited on a Friday and aired to people in their teams globally at the same time on a Monday. GB has become a well oiled machine, but it started as a live meeting when the company was only 40 people. As RG has grown from 40 to over 200 people in offices around the world GB grew with it from a meeting, to a side project for employees who wanted to join in, to a big production with a dedicated team and resources. As a company we put a lot of work into making sure we are as transparent as possible and building a great culture. We feel the format, style, and content of the Global Briefing fits perfectly with those two goals. That being said, GB works for a few key reasons- it grew organically, received positive feedback, and it was clear our team engaged with it. When you work in a tech company with a younger demographic the attention span of employees can be well- pretty limited. We understand what makes our employees tick and how to best communicate with them. It’s clear that a newsletter or summary email might not be received as well. Not every company has the resource, the time, or the need to put a GB together- but the point here is that it’s critical to really think about your own workforce and what would make your internal communication engaging, informative and even entertaining.